At Goldcorp’s Red Lake Gold Mines, a healthy conversation is underway, and it’s about something you wouldn’t expect a group of miners to be discussing – their feelings. May is Mental Health Awareness month and workers at Red Lake have been given conversation starter cards, mood buttons, email tips, offered stress reduction yoga classes and other resources as part of the corporate-wide Not Myself Today campaign to kick-start workplace conversations about mental health and engage employees in creating a healthier, more inclusive workplace. There’s even a mood wall on site for people to write down their feelings. But this health-related conversation doesn’t end in May. Mental well-being is just one of the health topics actively promoted throughout the entire year at Red Lake. Heather and her team have developed an innovative 12-month health promotion program called Passport to Health with monthly themes covering everything from cancer detection and hearing loss to smoking cessation, weight loss, and diabetes screening, all designed to reinforce the importance of a healthy lifestyle. 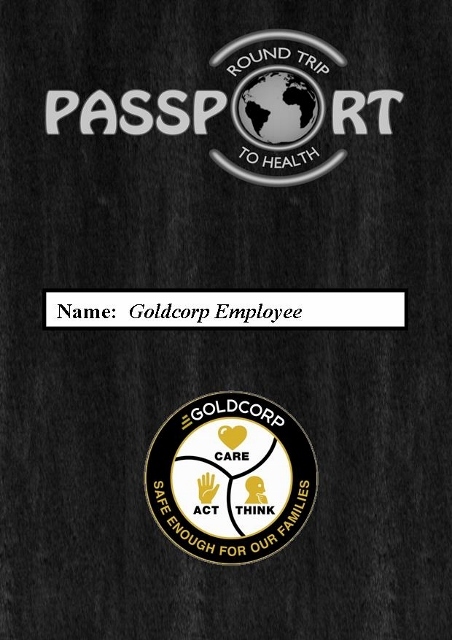 Employees who participate in the Passport to Health program are issued a “passport’ which contains a 12-month calendar with each month corresponding with a different health topics. February, for example, is heart health month. November focuses on cold and flu prevention and March is all about diabetes prevention and management. Each month, employees drop by the nursing station for a monthly health check, which involves getting their blood pressure checked during heart health month or blood sugar tests for diabetes in March. Health seminars are available, practical information is provided and quizzes and crosswords are used to actively engage workers in health topics. As an added incentive, every participant who completes their monthly health check gets their passport stamped and is eligible to win monthly prizes such as gift certificates and as well as grand prizes at the end of the year for those workers with all 12 passport stamps. The program has been a resounding success. In its first year, more than 600 employees participated in the Passport to Health program. More importantly, the Red Lake health care team has been able to identify a number of potential health concerns such as elevated blood sugar levels, abnormal blood pressure and vision problems that required follow up by a physician, enabling employees to make critical lifestyle changes. Building on the momentum of the Red Lake initiative, a second Passport to Health program was started at Porcupine Gold Mines in Timmins, Ontario in January 2015. In addition to building bridges with Goldcorp employees, word of the program’s success has reached other industries. A recent presentation on the health promotion initiative to a construction conference by Dave Yateman, Manager of Safety & Training, sparked several inquiries from local contractors on how they could implement Passport to Health in their industry, which clearly demonstrates that a good idea really knows no boundaries. We want to know - what workplace initiatives do you take part in that promotes a healthy lifestyle?